How Long Are Female Horses Pregnant? If you or someone you know has endured a long human pregnancy, you'll have empathy for your mare -- female horse -- as she enters her 11th month of pregnancy with her four-legged foal. 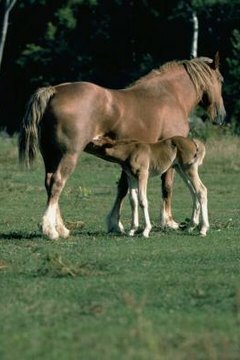 The average pregnancy term for horses is 335 to 342 days, or a solid 11 months. If your pregnant mare gets close to that one-year mark without giving birth, don't panic; 360 days, or just shy of one year, still falls within the normal gestation period for horses. Conversely, as long as she is healthy and the pregnancy has progressed well, your veterinarian won't typically declare a birth that occurs a few weeks prior to her 11-month date as premature. Don't make breeding decisions lightly. Make sure your mare and the stallion you select have desirable qualities. You'll need to monitor your horse's cycles to gauge when she is "in heat," which is when she's receptive to the stallion or is likely to get pregnant via artificial insemination. If the pregnancy or birth goes wrong, you risk time, money and the lives of the mare and baby. As a result of seasonal effects, if you breed your mare in February, March or April so that she is due in January through March of the following year, odds are she will carry her foal about a week longer than if you breed her later in the year. How Soon Will a Horse Have a Baby When She Starts Leaking Milk? How Soon Will a Horse Come Into Heat After Giving Birth? How Long are Miniature Ponies Pregnant? What Is the Difference Between Mules and Donkeys? How Old Does a Horse Have to Be Before Saddle Breaking?